In the past, teeth whitening has not been effective for some people because of their teeth being severely stained. Stains caused from tetracycline were thought to be one of the instances in which teeth whitening was largely ineffective. However, Dr. Loren Rench and the staff at Bayshore Dental are now offering a new innovation in teeth whitening and bleaching that has proven highly effective even with the toughest stains. The KoR Whitening System was invented by internationally renowned cosmetic dentist and whitening science expert Dr. Rod Kurthy. Thousands of dentists around the world agree that KoR Whitening System is by far the most reliable and effective whitening system ever developed. In fact, the KoR System is so effective; it is the only recognized whitening system that whitens even tetracycline-stained teeth in a short time! This was previously thought to be impossible. And now, these amazing KoR whitening results are typically achieved with little to no sensitivity! 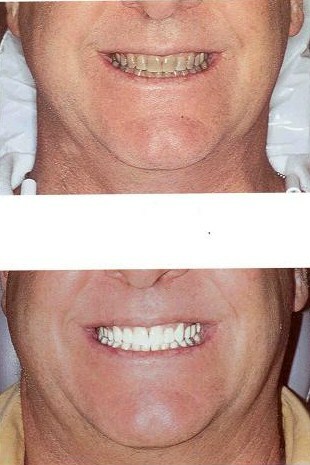 It also has the ability to further lighten teeth that have been previously bleached with less than spectacular results. KoR Whitening System was ranked the most effective, reliable way to whiten teeth permanently by a respected dental products journal. No other dental product, of any type, has ever been ranked higher than KoR Whitening System. It is the only whitening system to ever receive a rating of “Best Product” from Dental Products Magazine! So, if your smile could use improving, the superiority of KoR Whitening System is just what you need! Give us a call at 562-494-3477 today for a complimentary consultation to see if this could work for you! Not everyone was born with perfect teeth and a beautiful smile but that doesn't mean it isn't possible. It is our goal at Bayshore Dental to make sure that everyone has a smile that will make them smile.